The all metal construction of the Colt Defender makes it one of the most realsit feeling and also one of the most reliable pistols on the market today. 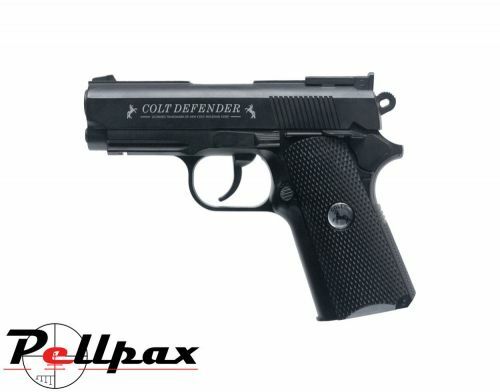 The Colt Defender comes equipped with a 16 round magazine that couples well with the pistols semi automatic action. The spring powered grip release of the CO2 compartment and the Defenders well made magazine combine to make this pistol incredibly easy to operate, perfect for those new to the world of airguns. The use of metal also gives pistol a realistic weight, in fact this pistol is as close as you can get to owning the real thing. This pistol is powered by 12g CO2 capsules and will provide around 30 - 40 shots per capsule, depending on temperature.